Sharknado, a new made-for-TV film in which Ian Ziering and Tara Reid have to battle sharks raining down from the sky, has attracted a huge storm on Twitter as it was first shown in the US. Airing on Syfy, the science fiction and ludicrous disaster film channel which has spawned such classics as Arachnoquake, Sharktopus and Aladdin & The Death Lamp, Sharknado rocketed straight to the top of the trends on Twitter. The plot, which was thin at best involved a gigantic hurricane sweeping up man eating sharks from the ocean and depositing them on Los Angeles, where unconvincing chaos then ensued. 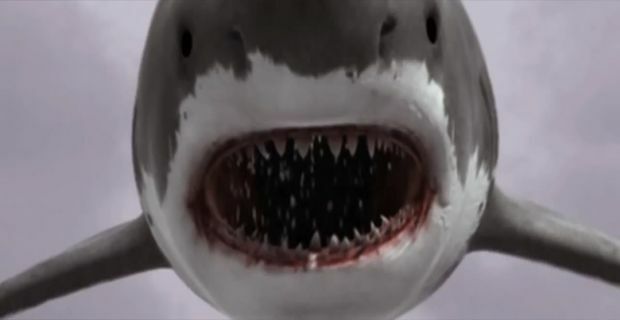 With LA under a few feet of water, these dangerously psychotic, and apparently able to fly sharks terrorise the populace until chainsaws and MaGyver style bombs are knocked up in the shed to rid the city of Angels from these half waterborne, half airborne predators. With Shakespearean lines such as “we can't just stand here and wait for sharks to fall out of the sky” and “we're going to need a bigger chopper” , is it any real surprise that Twitter exploded. "If you’re looking for one dimensional characters, terribly inconstant lighting, & sharks getin thrown out of tornadoes I recommend #SharkNado," said filmmaker Brian Naughton. Hookjaw Rox added: "We are SO fortunate to have this blessing to keep us entertained in between basketball and football season! #SharkNado #killme"
"Ways to kill an airborne shark. Shotgun, revolver, chainsaw, knife, big stick, bomb, Car, fire, pickax, sudden stop," tweeted Mike'l Severe, an Omaha, Nebraska, sports talk show host.